Mansfield has noticed growing interest in price risk management tools. Fleet managers who set their budget in the beginning of 2016, when crude prices were below $40/bbl and diesel wholesale rates were $1.00 or less (excluding tax), have felt the pressure of rising prices. With many analysts pointing to diesel wholesale prices surpassing $2.00 next year, how will you protect your fuel budget? The chart below shows historical volatility. Volatility is the amount of uncertainty or risk in price moves. The higher the volatility, the more uncertain its price variance. 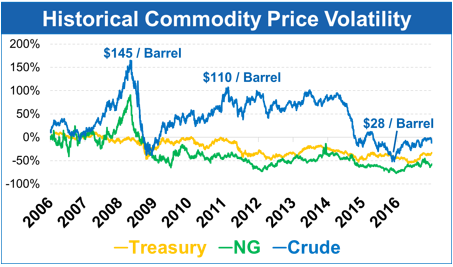 Crude prices, the key input to refined fuels, is by far the most volatile of the bunch. Whether you are a trucking company with customers that won’t accept fuel surcharges (as some customers ask to be billed on a fixed price basis) or a construction company that cannot raise prices once a project starts, odds are good you have some price risk. Mansfield sees customers in every industry struggling with fuel price risk. When it comes to recognizing your price risk, it’s important to keep in mind: Analysis is key. You may find that your company is large enough that you may need to reach out to fellow colleagues to make sure the risk you think you have is indeed a risk to the company. Some companies use risk management tools at the corporate treasury/CFO level, but do not communicate that down to the fleet managers. That’s an important policy to understand at your company. As you begin setting fuel budgets, the question you’ll want to ask is, “Does my company have fuel price risk?” Along the same lines, you may ask, “Can my company pass along fuel costs?” Can you pass rising fuel costs along to your customers in the form of fuel surcharges, or a straight pass through without sacrificing competitiveness? If you cannot pass along your fuel costs, then you certainly have price risk, and you need to seek out tools to manage it. If you’d like to learn more, I’m hosting a free webinar today at 1PM ET: 4 Rules for Successful Price Risk Management. The four rules will give you a framework for protecting your company from volatile prices. Click here to reserve your seat. If you’re not able to attend today, the recording will be available on demand for those who register.